to the world's largest Golden-inspired website! Since 1997 we have strived to help others strengthen and proactively lengthen the bond. Our 501(c)(3) nonprofit additionally provides cancer treatment grants for working dogs and funds research in comparative oncology. Getting your very first Golden Retriever is an experience that stands alone. 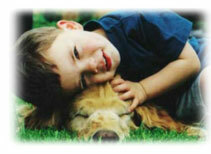 One of the friendliest and most lovable dog breeds, many people feel Golden Retrievers may truly be angels in disguise. Surely, they tempt you with their beauty. But, just as quickly, you are stunned by their determination and intelligence. Yet, it is their ability to read their human companion's thoughts and feelings that make them almost magical. Mordecai Siegal & Matthew Margolis offer a similar, heartfelt profile. "As you read this sentence, your lovable Golden Retriever is probably turning his water bowl upside down and splashing in the puddles with his large paws. He exp ects you to be as excited to see him and his puddles as he is to see you the minute you walk in the door. Your very presence makes him happy." "He brings you his ball and invites you to play with him as he smiles with his slurping tongue. But if something is seriously wrong and you feel bad, your Golden senses it right away and is likely to console you by gently giving you his paw or by laying his head on your lap." "He gladly shares your sadness as well as your happiness. Golden Retrievers are living proof that dreams do come true. It is impossible to keep your hands off these stand-up comedians. At times they are uninhibited clowns, and at other times they are the essence of canine dignity. To know them is to love them." So, please be sure to explore our many pages that take you through the early years as well as the time of mellow yellows. Learn about the concept of positive, motivation training and the many sports activities in which these kids excel. Make sure that you gain entrance to the Golden Gate of Health and that you accept the challenges and life-threatening illnesses that may come about. And, finally be prepared to say good-bye to the best friend you may ever have.